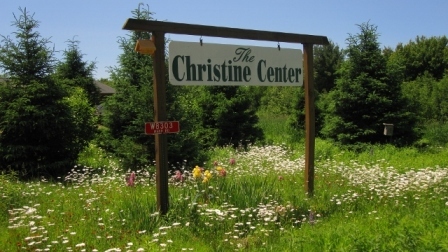 The Christine Center is nestled in 135 acres of tranquil woodlands in north central Wisconsin, two miles from Willard, about 1-hour southeast of Eau Claire. It’s about a 3-hour drive from Minneapolis and Madison, a 4-hour drive from Milwaukee, and 5-hour drive from Chicago. Click here for printable driving directions. These pages give directions from regional major cities. Use caution with Mapquest or Google Maps. Their directions may get you lost in this rural area. Please note: this is deer country. When traveling early morning or late afternoon or evening, use caution. Slow down, actively watch for deer at the sides of the road. If you see deer, wild turkey or other wildlife, please slow way down. Some animals are better than others at getting out of the way. Flights are available into the Minneapolis International Airport, Central Wisconsin Airport, and Eau Claire Airport. The closest bus station is in Eau Claire. The closest Amtrak station is about 1.5 hour’s drive in Tomah, WI. 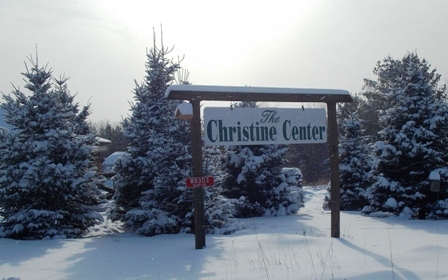 Note on travel arrangements: If you are flying in, please be aware that the Christine Center cannot offer ground transportation to or from the airport. Although we cannot guarantee availability, there may be local people who can provide that service for a fee. You can contact Uber and Lyft near the airport (see below), or there may be Willard-area locals willing to help. To explore the possibility of local drivers, please call the Christine Center office for more information. Find a Uber ride here. Find a Lyft ride here.